Yesterday I went walking along the Rillito river bed in Tucson and took some cuttings of desert broom. I made another slab menorah and used the plant to press a pattern into the clay. For this Eye Cup, I attempted to integrate the suggestions given to me by other people: a larger handle and no eyes in the vicinity of the handle. Hopefully the handle will be able to support the weight of the mug. I recently sold the Medium Normal Menorah on Etsy. I'm finding myself reluctant to keep making large slab pots since I'm mostly out of room to store them. Menorahs, on the other hand, can easily be stored in boxes. Menorah 24 (I have no idea how many menorahs I've made. I started numbering them at 11 in 2011.) uses the geometric patterns made by a doily. Menorah 25 uses a pattern made by a branch of a shrub with purple flowers growing outside the pottery studio. Hopefully I'll be able to provide the name by the time the menorah is completed. Menorah 26 uses a pattern made from branches of rosemary from my garden. I felt that the structure for the shamus candle was too narrow in previous menorahs, so I tried making a larger on on this menorah. This is #8 in a series of slab coffee cups. This one has a set of fangs and some gigantic round eyes. This is part of my next series of eye coffee cups. It has a mouth mold inspired by the lips of Patricia Quinn from the Rocky Horror Picture Show, but no eyes. This one is also part of a series of giraffe-inspired objects. The others are large and fragile and I'm going to keep them on my shelf until I accumulate enough work to commandeer another firing. 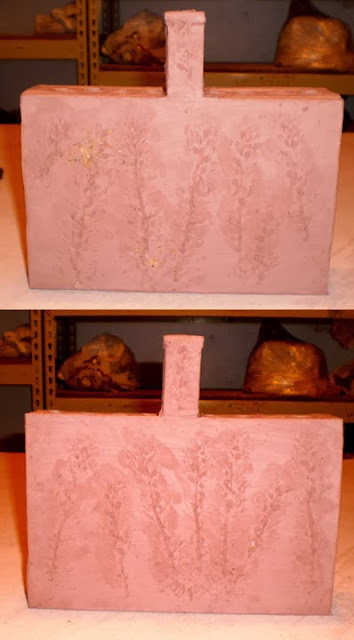 These are two more lips from molds based on Patricia Quinn's lips in the "Science Fiction Double Feature" sequence from The Rocky Horror Picture Show. I started a new series of Eye Cups. This one has a pattern with some vertical eyes. That last post about Impish Santa Mugs makes me aware of the encroaching Christmas season, about as close as I get to feeling Christmasy, even though it's only the middle of October. What does one do when the Holiday onslaught seems imminent? 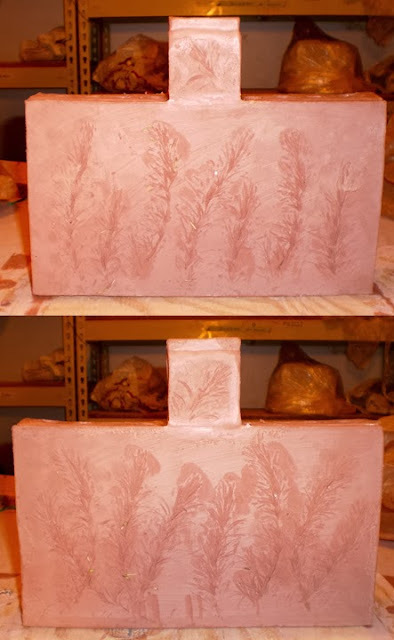 The obvious answer is to prepare by making extra pikaia, those loveable Cambrian chordates from the Burgess Shale. The one on the right is one of last year's crop of pikaia. 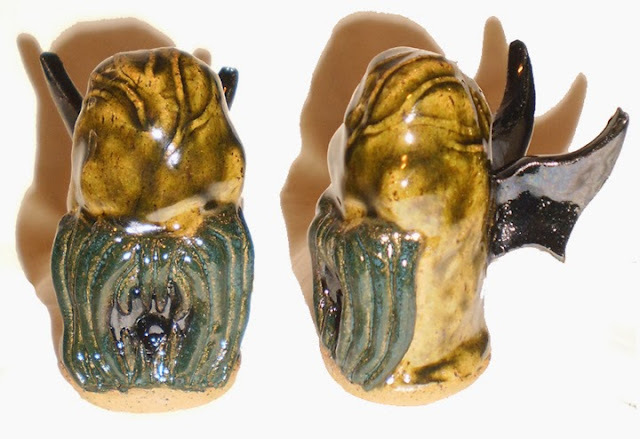 Someone left two tiny impish Santa Claus mugs at the pottery studio. These are my interpretations of them. This is somewhat outside my usual content domain, but I like how they came out. I resisted the urge to glaze the faces with transparent glaze. I think the slightly burnt look of twice-fired clay does a better approximation of (pale) skin. 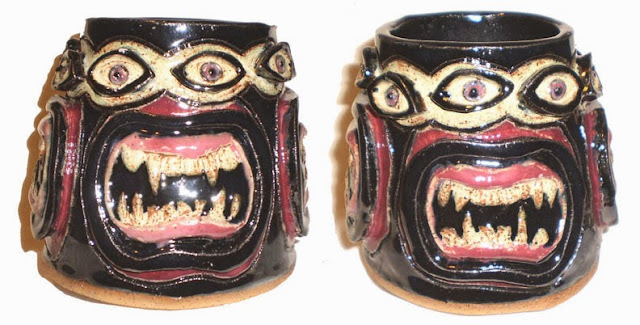 This is the fourth in a series of five coffee cups with patterns of molded eyes. This one also has an eye on the inside. 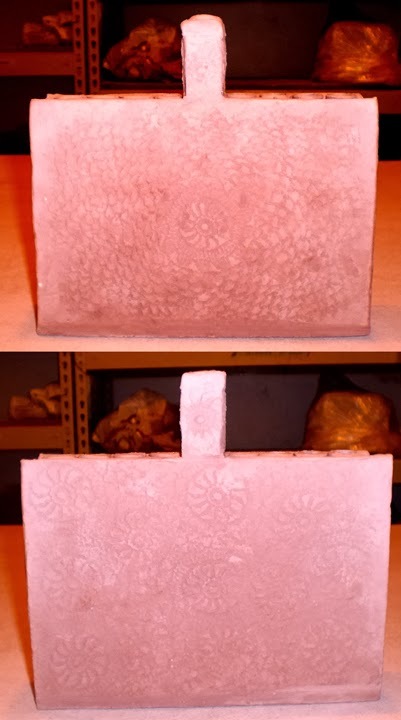 This is a slab pot, 5 inches tall, 5 inches in diameter at the base and 4 inches in diameter at the rim. It has a ring of red eyes and a fanged mouth repeated at each quarter. It's the start of a new cycle and I'm choosing to begin the cycle with ... interpretations of Sinistar from the 80s arcade game of the same name. 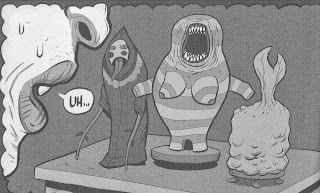 Mr Unpronounceable Adventures is a comic by Tim Molloy. Mr Unpronounceable is also the title character, a mad homeless occultist whose adventures frequently involve jarring space-time shifts, bizarre and grotesque otherworldly beings, and disturbing, visceral phenomena manifesting on his own body. In one sequence, titled "The Tooth Fairy," Mr Unpronounceable is conducting a ritual to "eradicate sadness from this coil of mortality forever." The ritual involves pulling out most of his own teeth and leaving them under his pillow. As he sleeps, a demonic, toothless entity climbs into his window and begins gumming his arm. Meanwhile, Mr Unpronounceable dreams of three strange objects on a shelf. 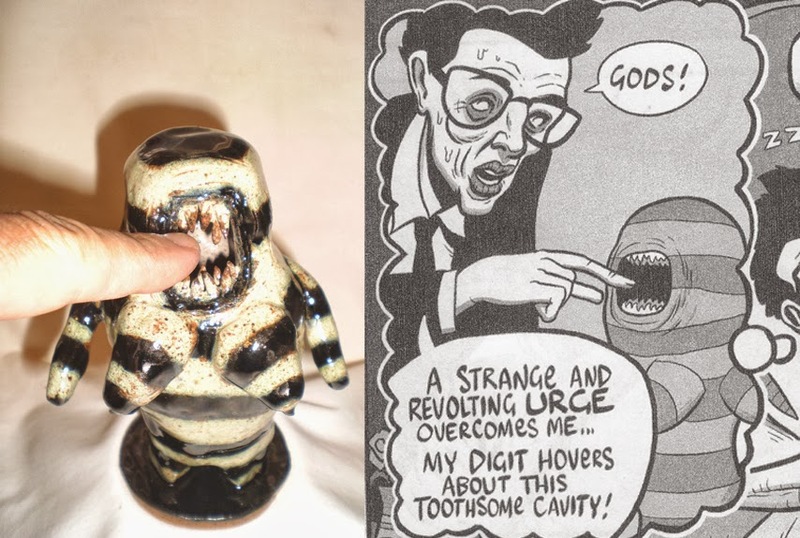 When I saw this part of the comic, I thought that these objects closely resemble my sculptural work - primitive, grotesque, and darkly humorous. The story ends with the demonic entity inserting Mr Unpronounceable's own teeth into its mouth and performing unspeakable acts on the sleeping body. I strongly recommend Mr Unpronounceable Adventures if any of this seems darkly humorous to you and not merely horrific. This is #2 in a series of five coffee cups with patterns of eyes and, in this case, part of a mouth. This is a piece from 2007 which I've posted about before. Here it is again with some better (or at least larger) photos. The giraluna is a spectral plant entity from Leo Lionni's classic alternate universe textbook Parallel Botany. This interpretation of it used a plastic worm mold which I wish I still had.